Thanks to everyone for creating such a buzz around Bogan Bachelor! Well, today we have a special surprise for you. A hilarious promo for the web series starring Jason Deane, April Gareffa and Robbie Ryde with a whole host of others that we are all massively grateful to. So check it out, show your friends and get pumped for the series! 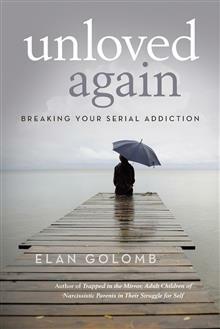 In Unloved Again, Dr. Elan Golomb identifies the crux of emotional and psychological problems which underlie love’s repeated failures. Only in addressing these deep-seated issues can one escape the dance of romantic folly. With this book you will uncover the secret to enjoying a happy and lasting love life. Elan is giving away a $25 Gift Card! 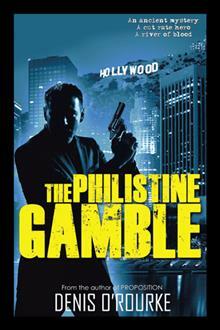 With The Philistine Gamble, O’Rourke adds mystery and a noir style to his mantra of Murder, Menace and Merriment. “Compost happens.” Discount private eye Nick Gamble says that a lot, usually when he opens the mail, but today it’s worse. Our flawed and philandering PI finds his friend and mentor, Bishop Francis Xavier Augustini, dead in the church office. It doesn’t help when one of LAPD’s not-so-finest Lieutenant Hardcastle catches Nick at the murder scene and takes him in for questioning. When Hardcastle asks for the thousandth time why Gamble killed his friend, Nick finally confesses. “It was Amway. The Bishop said I had to hold meetings, invite my friends. I only wanted to sell the soap. We argued.” Nick wants to know who really killed his friend, but the Russian Mafia, the Vatican Police, too many bad cops, and a three thousand-year-old, muscle-bound geezer keep getting in the way. They’re all after the same thing—an ancient manuscript worth millions. Nick’s going to need a lot of help, and he gets it. There’s Leo the massive mailman, a mini fridge with a bum leg and a trick door, a secret underwear gun, and Vera Foxxe, Nick’s able assistant and long-time bride to be—the sexiest woman on earth. If you don’t believe it, ask the Dalai Lama. This double feature will keep you guessing—and laughing—until the last page. Twice. Sorry, you’ll have to bring your own popcorn. Includes a preview of Toxicity. Attorney Riley Scofield returns in Denis O’Rourke’s exciting prequel to Proposition. Read inside: Acclaim for Denis O’Rourke’s stories. Denis O’Rourke lives in Arizona with his fabulous wife, Kitty O’Rourke. Before he became psychotic and began plotting bizarre ways to kill people and feel good about it, the author was an aeronautical engineer, a perpetual student, a certifiable public accountant, controller of a couple of Fortune 500 companies, and a congenital troublemaker. Most recently, he’s been a financial consultant, telling unsuspecting clients what they already know and charging them double. If you read his stories and can’t decide whether to cringe, cheer, cry, or chuckle, then he’s done his job, and he’d love to hear from you at http://www.denisorourke.com. Denis is giving away a $25 Gift Card! The authors will be awarding 1 print copy of Collective Ramblings: Volume 1,(international winner) or 2 ebooks (one of Collective Ramblings: Volume 1 and the second winner’s choice) to a randomly drawn winner via rafflecopter during the tour.